Quick Heal Technologies Pvt Ltd.
SoftPlanet makes it possible for everyone to get free Quick Heal Total Security 2013 download directly from our servers. There is no registration needed for downloading. If you have a computer today, you cannot use the Internet without proper protection against all kinds of threats. Quick Heal Total Security 2013 can give you such. It is an all-in-one protection for your PC and your mobile phone. This new and efficient tool provides real time protection and does not slow down your computer. It is also capable of cloud-based web protection, detects and removes unwanted applications and blocks USB devices from accessing your private data. Quick Heal Total Security 2013 has a free-for-download 30-day trial version which allows full user control for easy configuration. To use Quick Heal Total Security 2013 your PC must meet these system requirements: 256 MB of RAM, 1.46 GB of free disk space, 1 GHz or higher CPU and a CD or a DVD-ROM drive. You can install this app only in English and you have to activate it in order to begin to receive frequent definition updates. Some of the program features include Core Protection, Parental Control, Email and Web security, Browser Sandbox etc. Once you install Quick Heal Total Security 2013 you have to activate it in order to start receiving free updates. The Activate Now green button can be used for that. The program's main interface window has green and white dominating colors. The Settings, Tools, Reports and Help menus are in the upper right corner, while the Support link is at the bottom. For unknown reasons only four of the five main tasks fit in the first screen and that is why there is a second one too. Quick Heal Total Security 2013 has a PC Tuner which can speed up the performance of your computer by dealing with the programs and the services which starts on Windows log on. This feature works in four steps and can be completely tuned. For all the other features the developer has included slide On Off switch buttons to adjust most of the program settings. Quick Heal Total Security 2013 has many certificates and partners like Microsoft and Intel. It can even create an emergency disk which can be a bootable CD or USB that can scan and clean all your drives and partitions. During our tests this application showed very good results and we strongly recommend it to all users. 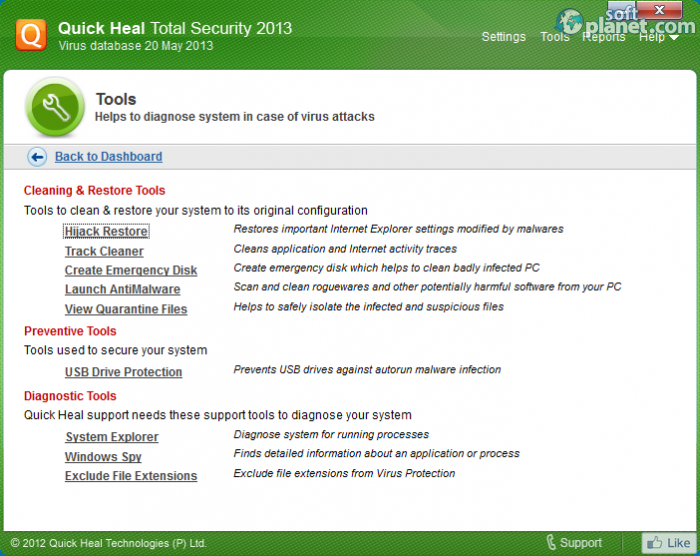 Quick Heal Total Security 2013 is VIRUS-FREE! 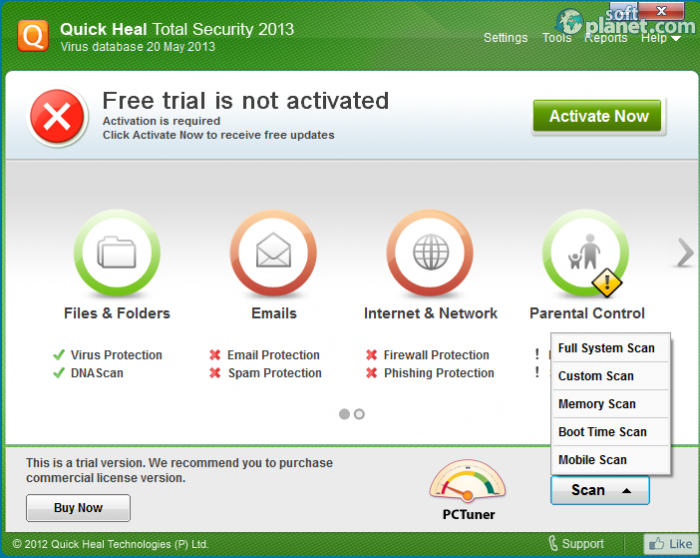 Our security scan shows that Quick Heal Total Security 2013 is clean from viruses. The current version of Quick Heal Total Security 2013 has been scanned by our system, which contains 46 different anti-virus algorithms. That ensures that Quick Heal Total Security 2013 14.00 - 7.0.0.4 is 100% safe for your computer.